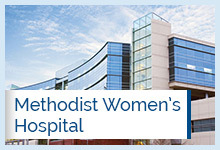 Methodist Women's Hospital Neonatal ICU is a unique environment that unites leading edge medical technology with clinical expertise, warmth, and compassion to give premature and critically ill babies the best possible start. When your tiny newborn needs extra care and attention, you can find comfort knowing that you will be receiving the highest level of NICU care in west Omaha at the Neonatal Intensive Care Unit (NICU) at Methodist Women's Hospital. The 51-bed NICU offers Level III care, which means we can provide care for newborn infants with extreme prematurity who are critically ill or require surgical intervention. This special environment for our tiniest patients provides special lighting and sound levels for optimal newborn development. Depending on the level of care your baby needs, Methodist Women's Hospital's NICU offers private rooms so you and your family can comfortably stay with the baby.